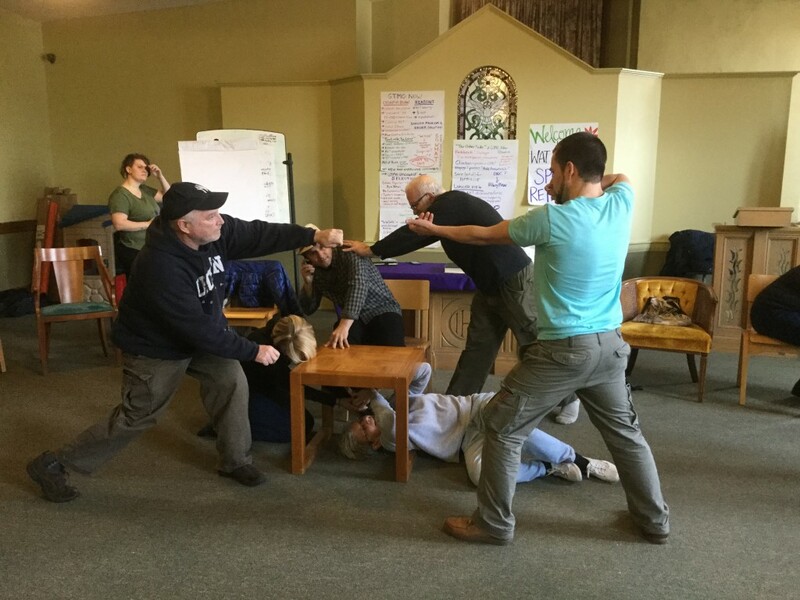 Witness Against Torture members gathered in Cleveland, Ohio earlier this month to reflect on the past year, renew our commitment to build together, and plan future projects. We have committed to implementing a variety of actions but will need our whole community to participate. We hope that you will join us in any and all of the actions that are being planned. First, we want to celebrate and acknowledge the long road of healing ahead for Omar Khalifa Mohammed Abu Bakr (43) and Salem Abdul Salem Ghereby (55), who have been “resettled” in Senegal. As we celebrate their long awaited freedom, we continue to hold these men and their families in our hearts and minds because we know that healing from the trauma and torture of Guantanamo is so much more than “resettlement.” It requires time, community, and even reparations. Over thirty members of the WAT community participated in the planning. Our work together focused on analysing the current political climate. We focused on Obama’s plan to close Guantanamo, the current elections, and the broadening climate of racism and Islamophobia. Jeremy spoke about how the state of Guantanamo is directly linked to Americans feeling “safe.” The fear of ISIS is being overblown so that Americans think being safe requires them to be exclusionary and intolerant which has bred an ethnonational racism. This is one of the reasons we see the detainees being demonized in the service of this intolerant propaganda. In our work, WAT has historically addressed the US government and those with the power to release the men, while at the same time reaching out to the detainees to let them know they are not alone. While this work is important, we asked ourselves if we could in some way speak more directly to the culture of fear and hate by attempting to vocalize some sanity into the public sphere and discourse. Given the current racist rhetoric in the election process, we might be able to get public attention by placing our clear anti-torture voice into the mix. In other words, let’s use the election to get the public’s attention. Maha spoke of distressing new developments concerning Muslim communities, particularly, the CVE (Countering Violent Extremism) campaign being promoted by the Obama administration. It is a “counter-terrorist strategy” that is completely focused on Muslim communities, which are expected to conduct surveillance on each other. It is penetrating and disrupting peace and conflict resolution efforts. In addition to deepening our analysis, we also created some chants and songs with Frank, Luke and Enmanuel from the Peace Poets. We delved into identifying white supremacy in our work and the ways we act to resist the violent structures of racism and capitalism (see pictures below). We addressed questions about the intentions of our civil disobedience and committed to some website and social media work. Needless to say, we did a lot of work over the two days! 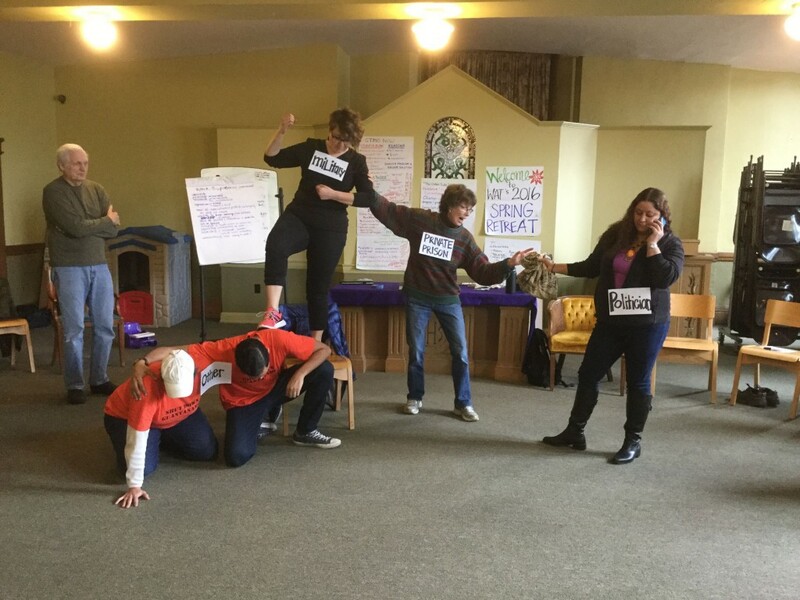 WAT members embodying resisting white supremacy through tableaus. If you are in New York City, please join the No Separate Justice Vigils at the Metropolitan Correctional Center (MCC) in lower Manhattan. The monthly vigil aims to shed light on and end a pattern of human rights and civil liberties abuses in “War on Terror” cases in the U.S. criminal justice system. You can contact us for more information. This project will work closely with WAT member and the director of the National Coalition to Protect Civil Freedoms (NCPCF), Maha Hilal to provide Muslim detainees in the U.S. with commissary money during Ramadan (June 6-July 6). We are currently looking for financial support for these efforts. Please consider making a donation to Witness Against Torture towards this work. This year will be focused on sharing the stories of the men in our local communities and public spaces. We will organize some online discussion forums and participate in a rolling Ramadan fast. Folks are also welcome to join Torture Abolition and Survivors Support Coalition (TASSC) activities in DC. More to come on this soon. WAT has accepted an invitation to participate in the People’s Convention the weekend before the Republican National Convention. We will be gathering to offer an anti-torture viewpoint and confront the hate-filled rhetoric of the Republican candidates. We are also planning on sticking around to find creative ways to engage the RNC. More details to be announced. Members of WAT will be joining SOA Watch on the border October 7-10, in Nogales Sonora, AZ. The goal of the gathering is to resist border militarization and engage in nonviolent direct action. We stand in solidarity with those working to expose the root causes of migration and end U.S. intervention in the Americas. Communication Management Units (CMU) are domestic prisons which hold an hold a majority Muslim population in terribly cruel ways. The people placed in these brutal units go without human contact for years. This policy and practice is currently being challenged by the Center for Constitutional Rights. Over the course of the next months WAT will begin a time of study and engagement in ending Communication Management Units (CMU). It will also involve reaching out to local groups who work to support families visiting their loved ones and overturning the court decisions that led to their detention. We will work to provide learning opportunities for the larger WAT community, as we study the relationships between detention of Muslim men in Guantanamo and those who are victims domestically through targeting, preemptive prosecution and incarceration. This year WAT will host a workshop on dismantling white supremacy in our society. The past few years have brought to light our need to address white supremacy in our organizing and we will spend two days this year reflecting on ways we enact and resist this in our work to close Guantanamo and end torture everywhere. We are beginning to explore a possible documentary project about life after Guantanamo. This project seeks to visit the men resettled around the world, in places such as Uruguay, and create a video that will spread awareness about life after detention with a focus on the long lasting effects of U.S. sponsored torture. Last but not least is our annual Fast for Justice, which will take place from January 8-21, 2017. We are encouraging our community to consider coming all the days of the fast this year. We will be building on the anniversary of January 11th to address the presidential inauguration. We lift up the life of Joe Morton, a sustained and beautiful person in our WAT community, as he passed away last week. He was a loving and encouraging presence in Witness Against Torture’s memory and work. We would not be who we are without Joe. We miss him dearly. We are reminded that even though we are spread out across the country and world, our creativity and desire for change, continue to fuel this work. As always, we cannot do this work without each other. Check out our latest news and updates on Tumblr. Post any pictures of your local activities to our flicker account and we will help spread the word. Witness Against Torture is completely volunteer driven and run. We have no paid staff, but do have expenses associated with our organizing work. If you are able, please donate here: http://www.witnesstorture.org. Witness Against Torture will carry on in its activities until torture is decisively ended, its victims are fully acknowledged, Guantánamo and similar facilities are closed, and those who ordered and committed torture are held to account.